Stampin' With Leah : Autumn - Winter Mini Catalogue. Autumn - Winter Mini Catalogue. Click here to view the new Autumn - Winter Mini Catalogue. The new Autumn - Winter Mini Catalogue has been realested. I'm so excited! Overflowing with new and exciting products your going to love it. With the new Simply Scored Scoring Tool, new products to use with the Big Shot like Framelits Dies, Edgelits Dies, Textured Impressions Embossing Folders and more. New beautiful Designers Series Paper with corodinating stamp sets and accessories. There is so much more in this mini. 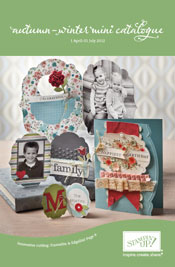 The Autumn - Winter Mini Catalogue starts on the 1st April until the 31st July 2012. Contact me to get your own free Mini Catalogue and to book your workshop showcaseing the new products.